The experience of regional and local labour market observatories shows that information on some aspects of the labour market – such as the demand for skilled labour in certain sectors or spatial units – is difficult to obtain. In the recent years, ICT-related innovations have created new forms and types of data that can be used for enhancing the efficiency in several areas of economic activity. So far, the vast amount of unstructured data contained in the World Wide Web – Big Data – has been largely unexploited. However, as the available technology provides increasingly cost-effective solutions, it has become possible to provide services that have formerly been too expensive. Therefore, applying Big Data in labour market monitoring can provide innovative insights into the functioning of labour markets. Also the process data of Public Employment Services or Statistical Offices constitute a promising source of large amounts of data. The results of the analyses based on the different sources of data can be used to improve the efficiency of the labour market at large and the provision of services by governments and private enterprises. However, the attempts to use Big Data in the context of labour market monitoring have been relatively rare so far, even though a growing interest can be observed among researchers and practitioners alike. Against this background, the issues of collecting, elaborating, analysing and disseminating the information available on the Web urgently needed to be addressed – as did the associated ethical and legal issues concerned with data ownership and protection. This year’s Anthology of the EN RLMM covers these issues from the viewpoint of labour market researchers and practitioners in labour market observatories from different European regions and localities. 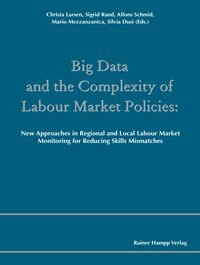 The contributions provide first insights into new models and tools of labour market monitoring based on the usage of Big Data.